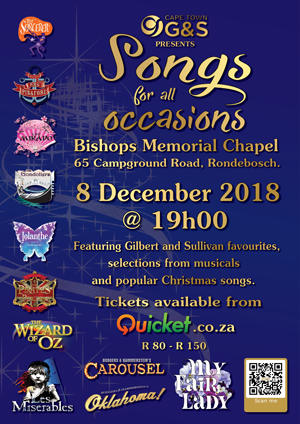 G&S presents Songs For All Occasions, a concert featuring Gilbert & Sullivan favourites, selections from musicals and popular Christmas songs. The concert will be held on Saturday, 8 December 2018 at the Bishops Memorial Chapel, 65 Campground Road, Rondebosch. Please note that seating is UNRESERVED, so arrive early to secure the best seat possible. The concert will start at 19h00 with a 20 minute interval.